Move over, Hot Pockets — Jim Gaffigan has moved onto bigger and better things. The comedian has his own show on TV Land premiering on Wednesday, July 15 at 10 p.m. and the show is bound to contain some of the same elements of the best stand-up jokes by Jim Gaffigan. The Jim Gaffigan Show will be somewhat autobiographical, with Gaffigan being married with five children and having the career of a comedian. Ashley Williams (TV fans will recognize her as Victoria from How I Met Your Mother) plays his wife, Jeannie, and in real-life, Jeannie Gaffigan is Gaffigan's wife and writing partner. As is the case with many stand-up comedians, Gaffigan's show will mirror his life — and will be peppered with some of the territory he has covered in his stand-up over the years. Gaffigan has multiple comedy specials and albums, including King Baby, Mr. Universe, Obsessed, and Beyond the Pale, where he makes jokes about his love of food, his paleness, and his oversized family, but his humor is not as a clean-cut as it sounds. And his TV show follows in his stand-up's footsteps by being about family, but not necessarily family-friendly. Although TV Land is the network the show is on, Comedy Central will also be airing new episodes within a week of their initial premiere on TV Land. Plus, with other comedians and cameos in the show (Michael Ian Black is a regular on the show and Janeane Garofalo had a spot in the second episode), fans of Gaffigan and stand-up in general will find something to laugh at in The Jim Gaffigan Show. 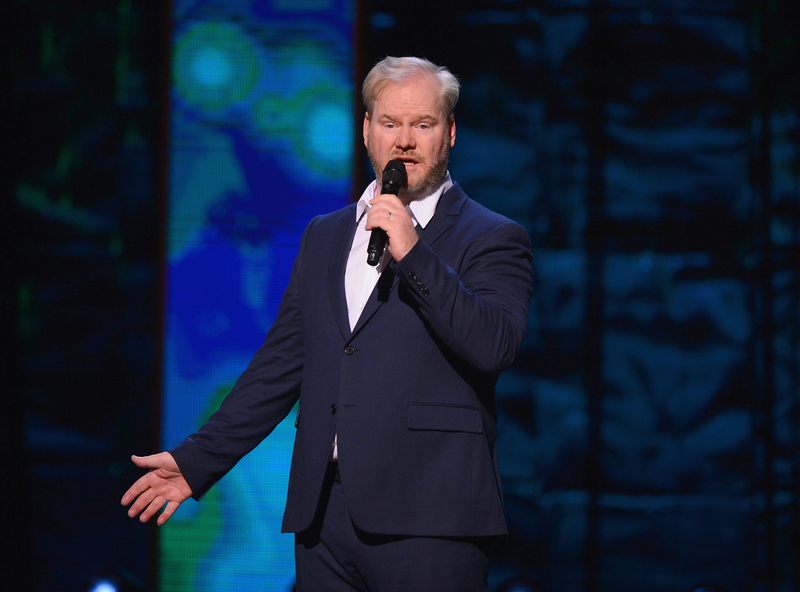 So before it airs on July 15, check out 11 of Gaffigan's best jokes. "You know God's up in heaven going, 'What do I gotta do to stop them from eating the crabs?? I gave it a rock-hard shell. I put it on the bottom of the ocean. I named a disease after it.'" As a woman currently living in the New England, I'm all about the shellfish, but Gaffigan's views on lobsters and crabs being giant insects and oysters being like snot, have made me reconsider my diet. But whatever, this comes from the man who is obsessed with Hot Pockets. "I can't believe we're still giving clothing as a gift. Cause whenever you get clothing as a present, you always open it up and you think, 'Not even close.' And the person that gives it is always like, 'You can take it back if you don't like it.' 'That's alright. I'll just throw it out.' Don't give me an errand." Making me go to the mall is probably the worst gift you could give me. "You ever have so much to do you just decide to take a nap?" Every day, Gaffigan. Every single day. "'Well, we love each other. Why don't we pretend we have a kingdom? We'll invite your parents' friends and my parents' friends and we'll have a banquet. And the two kingdoms shall come together as one. And we can start our married life with a total fantasy, before we go on a completely unjustified vacation.'" Gaffigan hit this one on the head. "You ever get a handwritten letter in the mail today? You're like, 'What the hell? Has someone been kidnapped?'" I am the friend who writes dissertation-length emails. "'My dearest Gwendolyn, I arrived by nightfall at the Embassy Suites. It will be a fortnight after my return that this letter shall arrive.'" Gaffigan really takes issues with letters in the age of the Internet. "I love our holiday traditions — like the Christmas tree, where we go out and we chop down a tree and put it in our living room. Kind of sounds like the behavior of a drunk man really." Let's decorate it for Jesus! "I never really feel comfortable right when I get in a bar. I'm always kind of like, 'Who are all these strangers?' But after a couple of beers, I'm like, 'These guys are probably my best friends.'" Bars are the adult version of nursery school — and they are where I meet all of my best friends. "'Here's a Sam Waterston. It's always bitter, but filled with righteous indignation.'" "Life is a little easier for attractive people. Can we admit that? Think about it, if a stranger smiles at you and they're attractive, you think, 'Oh, they're nice.' But if the stranger's ugly, you're like, 'What do they want? Get away from me weirdo.'" You don't have to agree with him to laugh. "Actually, the reason I look like this is because my father was from Sweden and my mother was Elton John." Pale people of the world, unite! And check out Gaffigan's show on TV Land and Comedy Central for more wisdom from the almighty pale one.